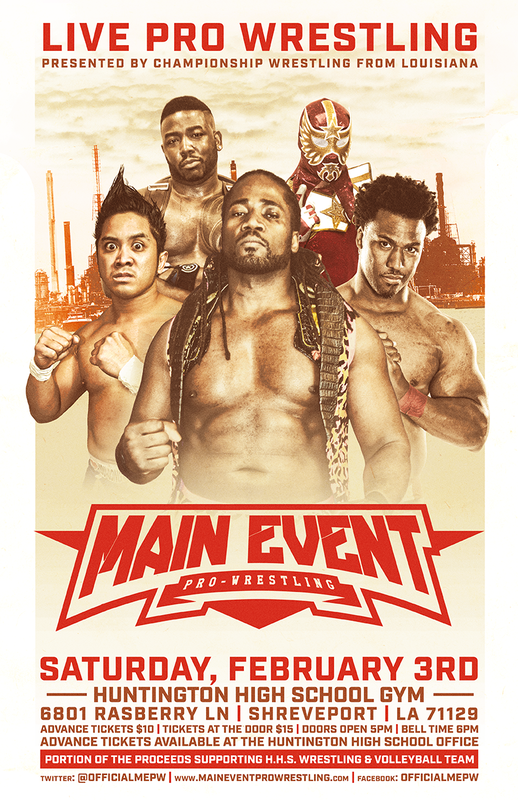 Main Event Pro Wrestling heads to the heart of the old Mid-South Wrestling territory with a huge event emanating from Shreveport, Louisiana which was the base of operations for Bill Watts storied wrestling program for many years taking place on February 03, 2018. Huntington High School hosts this mega event featuring the superstar roster with world class athletes such as former WWE & New Japan Superstar and reigning MEPW Tag-Team Champion Big Daddy Yum Yum and his partner Action Jackson. Luchador Estrella Galactica returns to MEPW action and the homegrown Southern Central States Champion Scott Murdoch will defend his championship. Making this event even more incredible is the fact that Dr. Death Steve Williams originally trained Big Daddy Yum Yum & Scott Murdoch locally in Shreveport. Dr. Death would be a mainstay all over the South as well as Japan making a name for himself on the Mid-South Wrestling circuit. Other native talents include Wildkat Wrestling Champion J Spade & Bu Ku Dao who come from Luke Hawx New Orleans based wrestling company in action along with Johnny Swole and a host of others. Matthew Roblez, known as the MK Bandit in wrestling circles returns to manage an unnamed superstar on this historic night on February 3, 2018. This incredible night of United Wrestling Network sanctioned action will also play tribute to Black History Month celebrating local leaders in the area while at the same time highlighting the huge impact of pro wrestling returning to Shreveport after such a long hiatus.